I think that most of you know a bit about the Meteor, the RAF's first operational jet fighter. Here is a bit about their initial usage. The first 20 aircraft were delivered to the Royal Air Force on 1 June 1944; one was also sent to the U.S. in exchange for a Bell YP-59A Airacomet for comparative evaluation. No. 616 Squadron RAF was the first to receive operational Meteors, 14 of them. The squadron was based at RAF Culmhead, Somerset and had been previously equipped with the Spitfire VII. After a conversion course at Farnborough for the six leading pilots, the first aircraft was delivered to Culmhead on 12 July 1944. The squadron now with seven Meteors moved on 21 July 1944 to RAF Manston on the east Kent coast and, within a week, 30 pilots were converted. The Meteor was initially used to counter the V-1 flying bomb threat. No. 616's Meteors saw action for the first time on 27 July 1944, when three aircraft were active over Kent. These were the Meteor's (and the Royal Air Force's) first operational jet combat missions. After some problems, especially with jamming guns, the first two V1 "kills" were made on 4 August. By war's end, Meteors accounted for 14 flying bombs. After the end of the V-1 threat, and the introduction of the ballistic V-2 rocket, the RAF was forbidden to fly Meteor F.1 on combat missions over German-held territory for fear of an aircraft being shot-down and then salvaged by the Germans, in any case, the greatly improved F 3 was in prospect. No. 616 Squadron briefly moved to RAF Debden to allow USAAF bomber crews to gain experience in facing jet-engined foes before moving to Colerne, Wiltshire. No. 616 Squadron exchanged its F 1s for the first Meteor F 3s on 18 December 1944. This was a substantial improvement over the earlier mark, although the basic design still had not reached its potential. Wind tunnel and flight tests demonstrated that the original short nacelles, which extended fore and aft of the wing, contributed heavily to compressibility buffeting at high speed. New, longer nacelles not only cured some of the compressibility problems but added 120 km/h (75 mph) at altitude, even without upgraded powerplants. 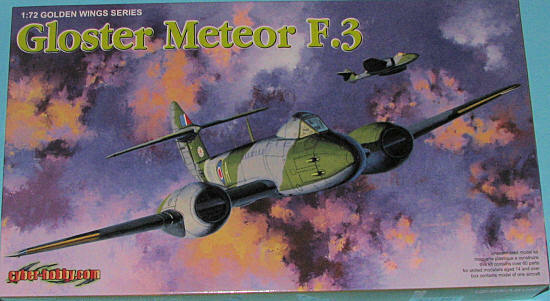 The last batch of Meteor F 3s featured the longer nacelles while other F 3s were retrofitted in the field with the new nacelles. The F 3 also had the new Rolls-Royce Derwent engines, increased fuel capacity, and a new larger, more strongly raked bubble canopy. On 20 January 1945, four Meteors were moved to Melsbroek in Belgium. In March, the entire squadron was moved to Gilze-Rijen and, then in April, to Nijmegen. The Meteors flew armed reconnaissance and ground attack operations without encountering any German jet fighters. By late April, the squadron was based at Faßberg, Germany and suffered its first losses when two pilots collided in poor visibility. The war ended with the Meteors having destroyed 46 German aircraft through ground attack and having faced more problems through misidentification as the Me 262 by Allied aircraft and flak than from the Luftwaffe. To counter this, continental-based Meteors were given an all-white finish as a recognition aid. Post war, they continued to equip squadrons and were shortly replaced by the more potent Meteor F.4. The remaining F.3s operated with the RauxAF until totally replaced. It is a real joy to see a mainstream company produce an updated kit of the F.3 Meteor. Prior to this, we relied on the Airfix kit, a rather elderly kit to say the least. Not that it wasn't a good one, but it has now been totally eclipsed by this new one from Cyber-hobby. 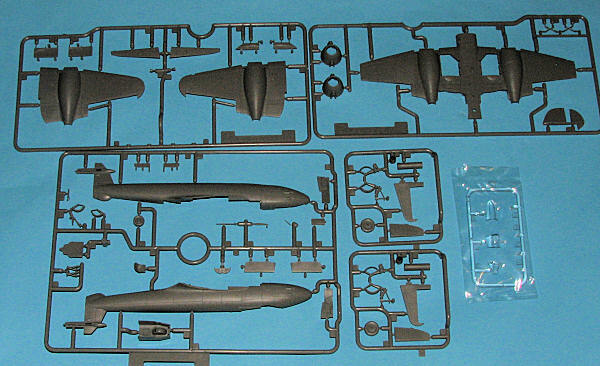 There are five grey sprues and all of the parts are superbly detailed. No rivets on this one, but crisply engraved surface detailing. The kit has a fully detailed cockpit with side walls that also incorporates the nose gear well. A separate rudder is trapped between the fuselage halves and the kit also includes separate ailerons, elevators and flaps. The flaps can be posed up or down as one desires. Landing gear on the Meteor are somewhat complex and Cyber-hobby manages to carry those off quite well. A very small photo etch fret (not shown) has the upper and lower speed brakes that simply fit into the appropriate wells. A clear, three piece canopy is included that can be posed open or closed as one wishes. Instructions are well done and provide not only the optional bits, but detail shots for proper alignment. Paints are by Gunze and Model Master. I found it interesting that no interior, wheel well or gear strut color information is provided. Markings are provided for eight aircraft. Those in standard RAF fighter colors are from 616 Sq at Lubeck in 1945 and at Manston in that same year, 74 Sq in 1945 and 257 Sq in 1947. In matte white are three options for 616 Sq aircraft in 1945. A single aluminum or high speed silver plane is for 500 Sq RauxAF in 1948. 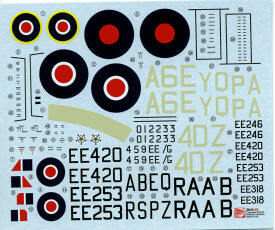 The decals are superbly printed, providing the sky fuselage band and a full set of stencils. I hope you are as pleased that this kit has been released as am I. I would like to think that this will lead to a full series of Meteors. For sure, this is probably the best one on the market in this scale.